I am an English speaking freelance translator and marketing reporter who loves meeting people. I also love to surprise everybody by telling the secret and the behind the scene of Japanese traditional culture. Would you love to wow? Please join my class! We have booked two sessions with Shino. The first to learn the rudiments of kimono wearing and the second to learn some of the obi tying. We were met by Shino at a JR train station so it is useful if you have a JR pass.Shino was a delightful guest and a great teacher. She teach not only how to wear kimono's but also the meaning behind some of the things related to kimonos and we were able to learn many things about Japanese culture and that by itself was worth it. Shino's english is very good too. I recommend the experience. Shino was a wonderful host! She is very knowledgeable about kimonos and is patient while teaching students to dress. Her explanations were precise and she included some unique information about kimono etiquette. I would highly recommend visiting Shino if you truly want to understand about kimono wear. What I found interesting is that I was not helped by the host to wear Kimono, but I could learn to wear it myself. My part favourite part has been the introduction with display of personal collection from the host and how they vary according to the season. Host Shino was not just wonderful teacher but also a lovely host. She is so lively and a happy person, and it did not take longer to get comfortable in the environment. 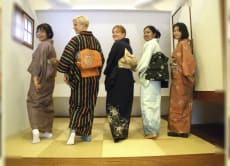 Tips for anyone who would like to attend this class, contact the host in advance and ask help in choosing kimono for yourself, as she mentioned she would be glad to help us buy one from the Harajuku area for the same amount we pay as rental. During the teaching session I happened to mention how much I love roasted green tea and Shino gave me a bag when I left. She is just lovely person to learn from.